(Pablo E. Piovano | Bloomberg) Agriculture Secretary Sonny Perdue at the U.S. Embassy in Buenos Aires, Argentina, on July 28, 2018. Washington • The government shutdown has stalled President Donald Trump’s program to send billions of dollars to farmers hurt by the trade war with China as the Agriculture Department office responsible for administering the payouts is closed for lack of funding. 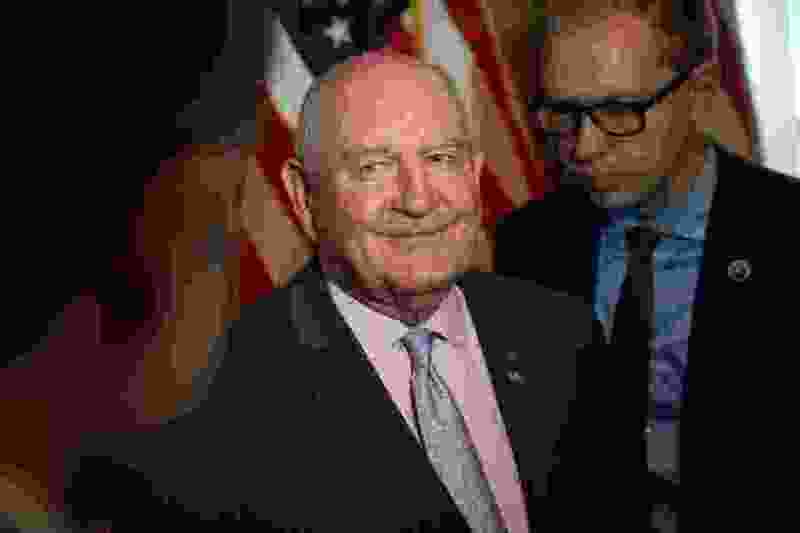 On Tuesday, Agriculture Secretary Sonny Perdue announced that the department has extended the deadline for farmers to apply for bailout payments. The application window was slated to close Jan. 15, but Perdue said Tuesday that the deadline will be extended, at minimum, weeks after the shutdown ends. The extension is one of a string of actions taken by the administration to limit the pain inflicted by the federal shutdown, even as the extended lapse in funding brings to a halt an increasing range of government functions. The move also reflects the administration's attempt to protect a U.S. agriculture community hurt by the downturn in commodity prices caused in part by Trump's trade war with China. Soybean-producing counties went for Trump by a margin of more than 12 percent, a Washington Post analysis last year found. The shutdown caused the Agriculture Department to run out of money on Dec. 28 to keep Farm Service Agency offices open. "Using existing funds, we were able to keep FSA offices open as long as possible, but unfortunately had to close them when funding ran out," Perdue said in a statement. "We will therefore extend the application deadline for a period of time equal to the number of business days FSA offices were closed, once the government shutdown ends." Amid criticism from Republican farm state lawmakers on the impact of its trade war with China, the Trump administration this summer unilaterally authorized up to $12 billion in bailout payments to farmers. China has slapped retaliatory tariffs on a range of U.S. exports, including agricultural products, amid the wider trade spat. The administration’s bailout included about $10 billion in direct cash assistance to farmers — the bulk of which would go to soybean producers — as well as about $1 billion to purchase excess food supplies to distribute to food banks and nutrition programs across the country. Bailout checks have continued to go out during the shutdown for farmers who had already certified their 2018 crop production. About $5.2 billion in bailout payments have been made since the program began, including approximately 360,000 payments since the federal shutdown began on Dec. 22, according to Tim Murtaugh, a USDA spokesman. But farmers who had not certified their crop production cannot do so, or receive bailout checks, until the shutdown ends. Mike Steenhoek, executive director of the Soy Transportation Coalition, said many farmers had late harvests this year and have not been able to certify their crop production. "There's a lot of worry," Steenhoek said. The shutdown has affected America's farmers in other ways. The Agriculture Department has delayed publication of several economic reports on commodity stockpiles and other agriculture data, which help farmers estimate the amount of production necessary for the following harvest. Also delayed are reports detailing the global supply of various commodities and projections of agriculture data on 44 countries — crucial data for thousands of farmers. In the Midwest, bankers are beginning to evaluate whether to extend another year of credit for farmers. Those decisions are increasingly difficult amid ongoing trade tensions and the absence of key government statistics. The shutdown started Dec. 22 amid an impasse over Trump’s demand that any plan to extend government funding included billions in taxpayer funding for a wall along the U.S.-Mexico border. Trump has previously repeatedly promised that wall would be paid for by Mexico.